On November 1 Venezuela’s human rights record was under scrutiny at the United Nations Universal Periodic Review (UPR) in Geneva. 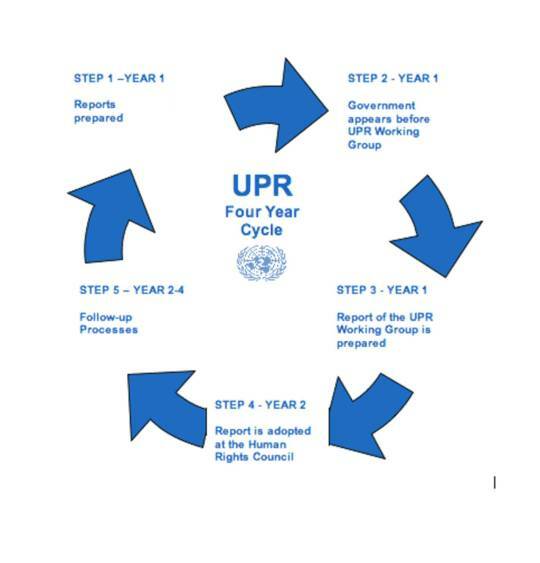 The review was part of the second cycle of UPR sessions. Venezuela was previously evaluated in October 2011. The government delegation faced tough questioning by several of the 103 countries participating. And the final recommendations were highly critical of the its record over the past five years. Member States and NGO’s (called “stakeholders” in the UN reports) are asked to present reports on the human rights situation of the country, other member States ask questions, and the UN Council of Human Rights makes recommendations to the evaluated State. The evaluated State can either accept or “note” these recommendations. Venezuela received a record 276 recommendations from 103 member States. The final report by the UPR summarizing those recommendations has still not been published. Before the session the Venezuelan government presented its report to the UPR defending its human track record. It also sent a heavy weight delegation to the session. Forty government officials traveled to Genève, including Venezuela’s Foreign Minister Delcy Rodriguez, Penitentiary System Minister Iris Valera, Health Minister Luisa Melo, and even one of the pro-government rectors of the National Elections Council, Sandra Oblitas. Other government officials made more specific defenses of several aspects of the human rights situation in the country. The Minister of Health said that Venezuela had reached the unprecedented rate of one doctor for every 250 inhabitants. Blanca Eekhout, Minister for Gender Equality, said that Venezuela’s extreme poverty had decrease from 10.8% in 1998 to 4.4% today. Human rights NGOs, including the Comité de Familiares de las Víctimas del 27 de Febrero (COFAVIC), the Programa Venezolano de Educación Acción en Derechos Humanos (PROVEA), and the Centro de Derechos Humanos of the Universidad Católica Andrés Bello (CDH-UCAB), contested the government’s picture of the human rights situation in the country. These reports by the human rights organizations were summarized in a document by the Office of the United Nations High Commissioner for Human Rights. But observers also noted that the number NGOs mentioned in the document had been inflated with several organizations supporting the Venezuelan government position, including organization from Cuba and Bolivia. In the UN report, COFAVIC argues against the government’s security initiative, the Operaciones de Liberación del Pueblo (OLP). The NGO says that alleged torture and police abuse cases have increased significantly and recommended that all security initiatives should be de-militarizes. PROVEA claims that the government has not compiled with the recommendations of the previous 2011 UPR cycle. Several NGO express concern for the lack of independence of the judiciary system. Opposition leaders Leopoldo López and Rosmit Mantilla are mentioned as cases of political prisoners. An extensive section of the report deals with numerous allegations of the freedom of expression, association and peaceful assembly. The recommendations made by member States show a significant increase in number from those made in 2011 (147 to 276 made in this evaluation.) United States and Canada recommended the immediate liberation of political prisoners. Canada also recommended the suspension of the OLPs. Italy, Austria, and Australia recommended Venezuela takes action against mistreatment of citizens by State security forces. Germany asked for the restoration of the independence and impartiality of the justice system. Uruguay said it is essential that Venezuela returns to the Inter-American Court of Human Rights. The Venezuelan government chose to address the review head-on with a sense of normalcy and confidence. Before it began, President Maduro predicted that UPR session would go smoothly for the Venezuelan delegation. “Tomorrow we have the UPR in Geneva…We have fulfilled all the requirements made five years ago (in the first cycle) and I believe that we will do very well in the UPR,” declared Maduro the day before the session. Local human rights organizations disagree and claim that Venezuela “failed” the UPR test. Carlos Nieto, coordinator of the NGO Una Ventana a la Libertad, wrote in a piece reposted in the PROVEA web page that the numbers shown by the Venezuelan delegation are not trustworthy. As an example he claims that that Venezuela has built only 5 prisons, and not 29, in the last 17 years. He also questioned that numerous groups, such as the “Baseball Association of Bolivia” and the “Cuban Federation of Road Sports,” which presented reports to the UPR as human rights stakeholders. The NGO Observatorio Venezolano de Prisiones also argued that most of the numbers on the prison system provided by Minister Valera were bogus. Minerva Vitti, chief editor The Revista SIC, a publication of the Jesuit linked research center Centro Gumilla, published an article entitled “The lies in the UPR and the eternal wait of the indigenous people.” She contested the assertions by the government delegation about advances in the situation of indigenous people in the country arguing that even as there has been progress in the recognition of indigenous identity, the Venezuelan State has failed to consult with them sensitive issues such as the proposed Mining Arch planned by the government for the south of the country.